Melanoma skin cancer is one of the malignant tumours whose incidence, in terms of the number of patients in Europe IS constantly rising. Melanoma is a form of cancer that can be diagnosed at an early stage, because it is the only malignant disease that can be detected with the naked eye, which is certainly a mitigating factor. Symptoms of skin cancer usually starts as a small marks on the body, i.e. black or brown spots on the skin, in women they are most common on the calf, and in men on their backs. Melanoma is most common in people older than 50 years, as well as those who had a long-term or intense sun exposure. One in six people from the risk groups are diagnosed with melanoma. Pay attention to the following warning signs that may indicate whether it comes to skin cancer or something else? Skin cancer; how to recognize it? Asymmetry: When you see the birthmark lengthwise are both sides identical? If not, it is the asymmetry and you should go for a medical examination. Limits: A winding line of edge or mushroom shaped birthmark also may indicate a change. If it is not round or oval shape, it should be checked. Colour: Are changes on the birthmark have more colour? Pay attention to all shades of pink, dark brown, white or black on a changed mole. Diameter: If the birthmark of the skin has a diameter greater of 5-6 millimetres, you should contact the expert. Changes of birthmarks in colour, size, shape, symptoms (eg, softness) may indicate skin cancer. Skin melanoma - Who is at risk? Once we determine how to identify melanoma of the skin, it should be known what risk groups are involved. To the risk of melanoma or other forms of skin cancer all people are exposed, but some groups are at greater risk than others. These are primarily people who have fair skin and are prone to sunburn. Those who have suffered sunburn in childhood, people who spend many hours in the sun (for example, because of work or hobbies) or are exposed to intense sunlight for a short period (for example, during holidays), people who use tanning beds, those who have more than 50 birthmarks or a family member who had skin cancer, older than 50 years, and patients with transplanted organs. Skin cancer has four basic categories of diseases. The first three categories of melanoma occur in the upper layers of the skin and sometimes become invasive. The fourth category are invasive melanomas from the start, which makes them more serious form of the disease, because they are in deeper parts of the skin, where it can also spread to other parts of the body. This type of melanoma is long swept through the surface layer of the skin before it penetrates deeper and is the most common form of cancer (about 70% of all cases), which affects young people. First symptoms of melanoma are common growths (sometimes at the level of the skin) uneven colours and edges, and asymmetrical shapes. The colours of melanoma vary from brown and black, over red and blue, to white and tan. Skin cancer in this type can be developed from a benign mole, on any part of the body, although in men it usually occurs on the body, women on their feet and in both sexes in the upper back. Appearance: It is similar to surface melanoma, which means that it will stay in the surface layer of the skin, and is usually a small segment of the skin that is raised slightly, black, brown and tan. Lentigo maligna is usually discovered in older people on parts of the skin that are most exposed and damaged by the action of the sun - on the face, ears, arms and upper body. When this form of cancer becomes malignant, it is called lentigo maligna melanoma. This skin cancer can also spread near the surface before it is spun into the deeper layers. However it differs from other types of cancer, because it usually appears as a depigmentation of brown or black under the nails, on the soles of the feet or on the palms. However, this type of melanoma occurs almost exclusively in Black, or Asian population, and is very rarely in the skin. This skin cancer, at a time when it is diagnosed, is usually more invasive. Malignant melanoma is detected when moles form nodules. It is usually black, but can be grey, white, blue, brown, red or skin colour. Typical sites for this type of melanoma are torso, legs and arms, mostly in older people, but also on the head usually in men. This is the most aggressive type of melanoma, and occurs in 10-15 percent of all cases. Birthmarks and moles are quite normal and everyone has them, but changes on them can be a warning of a serious illness. Skin cancer compared to other forms of cancer, is fairly easy to spot, because we see it with the naked eye, and if detected early in many cases it is curable. So the importance of early detection and the beginning of the treatment of melanoma and other potentially dangerous skin changes before they become a problem is extremely important. 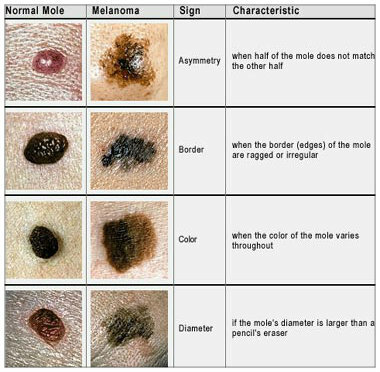 Education about moles is necessary so that everyone could learn how to recognize a potential skin cancer melanoma. Increasing awareness of the dangers of melanoma and other skin cancers is very important, starting from general practitioners and other healthcare professionals, such as physiotherapists and medical nurses and employees in wellness centres. Namely hairdressers, beauticians and masseurs are the first line in the detection of melanoma and that in most cases, they are daily in an ideal position to identify suspicious skin changes and recommend to people who are at risk for a consultation with the doctor. Methods for the treatment of skin cancer are determined by a physician based on the stage of disease, age of the patient, the general health of the patient, as well as what type of melanoma. Standard methods to remove moles are primarily surgery, which in most cases is sufficient, while in patients with severe stage of the disease chemotherapy followed by immunotherapy. It is import that young people remove them completely. Sometimes moles are treated with radio waves. As an additional therapy recommended are cures from the nature. When it comes to skin cancer effective are following plants: marigold, celandine and plantain. It is best to prepare tea that can be drunk several times a day with fresh juice. If the skin cancer is detected early, before it caught deep layers of the skin and surrounding tissues and organs, and adequate therapy and treatment is used, the prognosis is generally positive. Many people are greatly mistaken that the removal of moles and birthmarks is dangerous and that it will only worsen the situation. It will prevent skin cancer from progressing, and surgical intervention is necessary. If the symptoms of skin cancer are ignored and neglected, and doctor is not contacted in time, the chances of cure are minimal. Malignant melanoma is growing and sometimes there are no symptoms: Although it is the most aggressive skin cancer, if not noticed on time and if it starts bleeding and causing pain it is too late. Do not let it happen but contact your doctor on time.